Hot air is the new hot oil, and De'Longhi Air Fryer demonstrates that the best. In today’s hectic world, we’re always looking for ways to save time. It’s no secret that we want to make our meals as fast as possible. The innovative technology featured makes it easy to cook with little or no oil at all. Join us as we review and compare the air fryer with Power Air Fryer XL, and many more known airfryers. Therefore, if you’re interested in how to cook healthier and faster than ever, keep reading to find out more about De’Longhi Air Fryer. 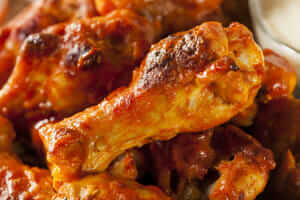 ​What Can You Cook In An Air Fryer? How do Air Fryer work? De’Longhi is a well-known name when it comes to kitchen appliances. Now, we’d like to talk to you about the two of their most popular multifryers. At first, they may seem like the same product, but they’re not. There’re some similarities, of course. For example, they’re both multifryers. On the other hand, we simply must mention some crucial differences, too. For this reason, we’ve prepared this comparison table. Our goal here is to show these two appliances side by side, in order to see their similarities and differences. As you can see, there’re very few differences between these two models of De’Longhi air fryers. Obviously, the biggest one is cooking capacity. From the table above, we see that De’Longhi FH1363 has the capacity of 3.7lbs, while the other De’Longhi air fryer fits 3.3lbs of food. However, De’Longhi FH1163 weights somewhat less than De’Longhi FH1363 does. This isn’t that important, really, because once you place your air fryer on the counter, you won’t be moving it a lot often. They’re very similar in many important things, such as cooking method and wattage. When it comes to a De’Longhi Air Fryer, you can always be sure it comes with a useful set of features. The case of De’Longhi FH1363 Air Fryer is no different, of course. Probably the most important feature is its Surround cooking system. 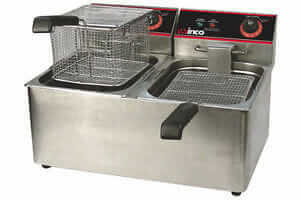 More precisely, this cooking system consists of two heating elements that surround the food allowing it to cook evenly. The upper heating element is 1200 watts, and the bottom is 200 watts. Combined, these two heating elements of De’Longhi Air Fryer provide fast and even cooking process. Another feature providing excellent experience is a mixing paddle. This feature is especially good for various reasons. First and for most, it stirs the food so you don’t have to. Imagine how much time you could save by not having to be constantly in the kitchen. Roast, sauté, and fry with the help of the mixing paddle. Anytime you want to grill, bake, or broil, you can simply remove the paddle. This De’Longhi Air Fryer gives you the performance of a commercial air fryer right on top of your kitchen counter. The list of convenient features of this De’Longhi air fryer﻿﻿ doesn’t end here. We must mention the transparent BPA-free lid. We all know that opening the lid can make the heat drop, and isn’t really safe. Now, you can watch all your food being prepared without opening the lid. Since it’s a multi-cooker, there’re number of things you can do with the De’Longhi Air Fryer. However, what about cleaning? Luckily, paddle, lid and bowl are all removable and dishwasher safe. Also, the cooking capacity is quite large. It allows you to prepare about 3.7lbs of fresh potatoes and 8 cups of french fries. There’s no limit to De’Longhi Air Fryer recipes, meaning you can broil, cook, bake a cake, grill, roast, fry some french fries, etc. One of the first questions we ask when buying kitchen appliances is how much counter space it’s going to take? This is normal, because in most cases, counter space is precious. Well, when it comes to this De’Longhi Air Fryer model, opinions are split. More precisely, the dimensions are 15.6 x 12.8 x 10.6 inches. What’s for sure is that this electric air fryer is on the big fryers’ side. However, you must consider its capacity. We’re talking about the cooking capacity of 8 servings of french fries. You have to agree that’s enough to feed quite a lot of people. Therefore, it’s large dimensions are justified. An electric air fryer such as this comes with some nice details. It’s easy to see that the manufacturer has put a lot of thought in this air fryer. Simply, De’Longhi FH1363 is an electric air fryer that uses little to no oil at all. This allows you to prepare healthier meals for your family and you. In addition, it’s a multi-cooker. What this means is that there’s no limits to foods you can prepare in it. Also, the mixing paddle makes it easy to do something else while the air fryer is cooking your food. Of course, warranty is one of the most important things to look at when buying anything. You can easily get a copy of manufacturer’s warranty by emailing De’Longhi customer service or visiting their website. Naturally, the warranty may not apply at all times. Like in most cases, De’Longhi doesn’t cover misuse of the Multicooker. Also, where you buy the fryer and who you buy it from may also affect the manufacturer’s warranty. Pros and cons are extremely helpful when deciding on a product. Simply, the form of side-by-side comparison makes it easy to decide whether the appliance is worth it or not. In the case of De’Longhi air fryer, this table of pros and cons makes it obvious. One of the most important things about FH1363 is that it features two heating elements. Also, the paddle really makes the difference because it allows you to save time and multitask. Its only con is that it’s big. Although, if you consider its capacity and you have a large family to cook for, this won’t be a problem for you. 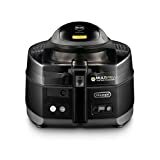 The surrounding cooking system and ease of use made this air fryer one of the best on the market today. Finally, it’s rated with 4.1 out of 5 stars. As with all the products, additional questions always exist even with De’Longhi FH1363 Air Fryer. No problem, though, because we’re here to answer all the questions you may have. Some people love asking us to compare De’Longhi Air Fryer with other similar air fryers. While it all comes down to the same thing, which is air frying, trying to find differences isn’t as easy. However, they do exist. For example, GoWise USA air fryer does’t feature a mixing paddle and it’s quite smaller. 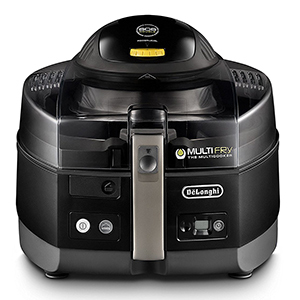 Let’s see a few of the other popular air fryers compared with De’Longhi Multifry. When it comes to De’Longhi Multifry compared with Philips Viva Air Fryer, or Philips XL Air Fryer, there’re some big differences. Apart from the fact that they’re all air fryers, cooking healthier food, their features make them different. De’Longhi FH1363 features a mixing paddle and transparent viewing window. On top of that, none of the mentioned Philips models are as large in capacity as De’Longhi FH1363 air fryer. Also, the technology used by Philips models is different. More precisely, De’Longhi air fryer features two heating elements, which isn’t the case with Philips Viva, or Philips XL air fryer. If you’ve tried T-Fal Actifry at some point in your life, you probably have a glimpse of how to cook healthier food. These two air fryers may be the most similar out of all. Both of them are versatile, cook without oil and feature a mixing paddle. However, in our opinion, De’Longhi Multifry is simply easier to use. Also, De’Longhi FH1363 features surrounding cooking system, which isn’t used by any other airfryer. At this point, we’re quite sure you understand why having De'Longhi Air Fryer in your kitchen makes life easier. Not only you’re cooking food that’s healthy, but you’re doing it easily and quickly. Also, what would saving time be like if you’d have to do a lot of cleaning? Luckily, De’Longhi thought about that and made FH1363 that’s very easy to clean. De’Longhi air fryer brings new technology that’s quickly concurring fans everywhere. 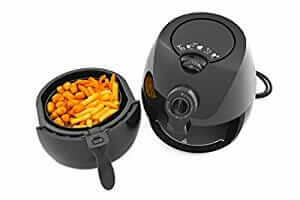 Have you tried any of the air fryers we mentioned? What’s your opinion on air frying? What’s your experience with De’Longhi FH1363? Please let us know and leave a comment below to join the discussion.